Sue Wilson Reports: NYTimes on Breitbart: STILL getting the ACORN story wrong! NYTimes on Breitbart: STILL getting the ACORN story wrong! Wow. 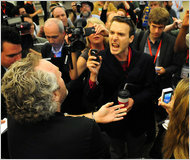 Little did I know as I followed Ryan Clayton with a camera as he confronted Andrew Breitbart at the recent NetRoots Nation conference in Minneapolis that New York Times Reporter Jeremy W. Peters was also there, doing an "expose" on the conservative provocateur. But in what has become a disturbing pattern at the so called "Paper of Record," the New York Times reporter then writes a puff piece about Breitbart which downplays his underhanded role in mis-portraying liberals in order to destroy them. "Some of his reader-generated scoops have reverberated all the way to the halls of the United States Capitol, like the Weiner photos and undercover video he released of Acorn workers offering advice on how to evade taxes and conceal child prostitution. After the videos went viral Congress ended grants to Acorn, and federal agencies severed ties with the group. " This would be a great story if this were a fairy tale, but this is the New York Times, which until recent years actually checked facts and reported news. "... after telling the ACORN worker that her pimp (not O'Keefe!) had beaten her and stolen her money, the sympathetic worker tries to offer advise on how to hide the money from the pimp, not from the government! The other frequently cited piece of misinformation concerns the ACORN worker who advised that Hannah use the IRS code for "performance artist" when filing her taxes, since there is no code for "prostitute" on those forms. As in all of the offices, the workers were explaining how Giles had to report her income and pay her taxes --- rather than evade them --- even if her income was from prostitution." You want all the facts on this? Read Brad Friedman's reporting on this, he owns this story. But here's my point: there is a reason that I am so passionate about calling out the tactics of Andrew Breitbart and his minions. The man is perpetuating a fraud - not just on the American people , but on our very democracy. I am talking about someone who calls himself a journalist who worked to set up the ACORN organization with a hidden camera (like a Candid Camera/ Borat comedy,) asked honest employees bogus questions, then edited the video to mislead viewers and lawmakers, all for political gain. It doesn't matter if it being done on the "Right" or the "Left," it is wrong. Despite the comment in Peters' article that people today tend to "select facts" they agree with, at the end of the day, nobody wants to be lied to. If people fully understood the lies they are being spoon fed by the Right Wing Media, I think they would be quick to seek out honest, trustworthy reporting. But, as I reported more than a year ago, the New York Times fails that test. They failed it with Judith Miller, they failed it with ACORN, they failed it with Breitbart. The "Paper of Record" just doesn't seem big enough to correct the record. Thank God for bloggers, but not all of them are as accurate as Friedman, either. So let me say this to all who have a microphone on Radio or TV, and to all those who are paid to write for print publications: We the People need you to do the hard job of real reporting. We need real facts to make real decisions. Just because some may enjoy it, please don't make our democracy into a sideshow. We are counting on you.